Launching as a competitor to Steam, Epic Games announced to start their own digital storefront Epic Games Store. Whether you have been indulged into the Battle Royale mania with free-to-play title Fortnite or not you probably must have heard of developer/publisher Epic Games. Amassing a staggering number of 125 million worldwide in less than a year, they have scored big time! After winning over the gaming world with a phenomenon game lately, Epic Games is currently focusing on a major online game distribution platform of their own, which would be a competitor to Steam, a prominent digital storefront of Valve Corporation. This is not something that Epic has jump on board with and in fact, they have been developing launcher for their own game compatible for Mac and PC that supports a digital commerce worldwide by handling several different payment methods. 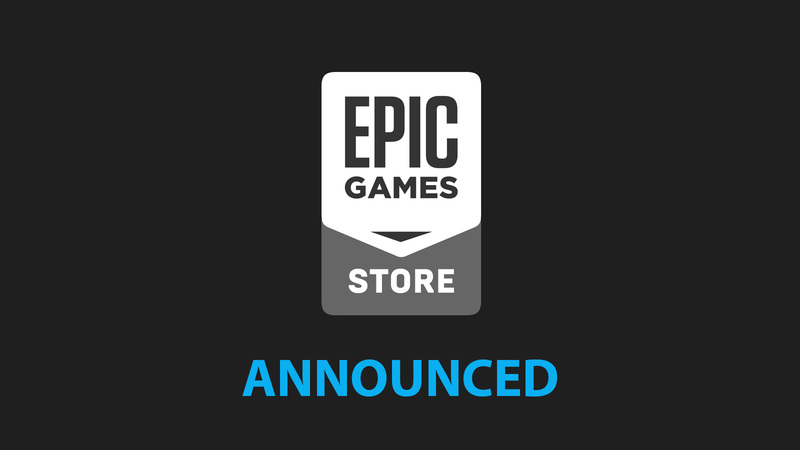 So, to get into a direct relationship with players and help all developers, Epic Games Store will be launched soon. Though their initial plan only includes platforms like Mac and PC, there are plans for expanding to Android and other open platforms for a broader reach by 2019. Epic will open up with a hand full of curated games and then will expand their collection as they progress. People can either purchase the game from the store or just access it with Epic Games launcher but everything else will be handled through the application. Current Fortnite players are already considered as users of their launcher and Epic Games decided to make their game exclusively available to their digital store. This is a practice that would be continued for the foreseeable future. The biggest perk of the platform is that it offers a more flattering revenue split with developers than Steam or any other. 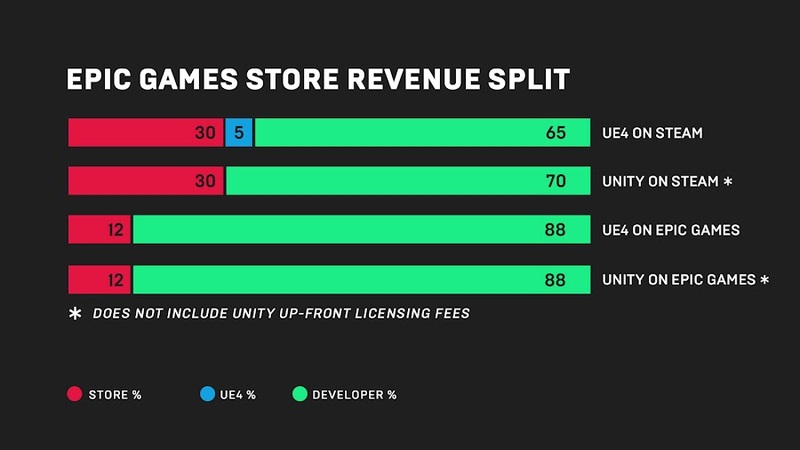 Moving aside from the standard 70/30 revenue split, Epic Games Store is considering giving developers 88 percent of the revenue for the games. It that is not sounding crazy enough, developers won't have to pay up the 5 percent engine royalty for using Unreal Engine to create the game. Epic will cover for that 5% of extra charge from their small margin on a total of 12%. Epic Games CEO Tim Sweeney believes that business for digital storefronts have grown quite exponentially over the decade but the economies revolving around it has not benefited the developers much for years; especially indie developers. Aside from that, Epic also launched Support-A-Creator program recently that will hook up content creators from YouTube, streamers on Twitch, video game Bloggers and such with developers to help them share revenue for affiliate marketing. That's so EPIC! Consumers of the store will be handed out at least one free game after every two weeks throughout 2019 and they will cover the fees of those releases on behalf of the developers, so they don't miss out or lose money over this. 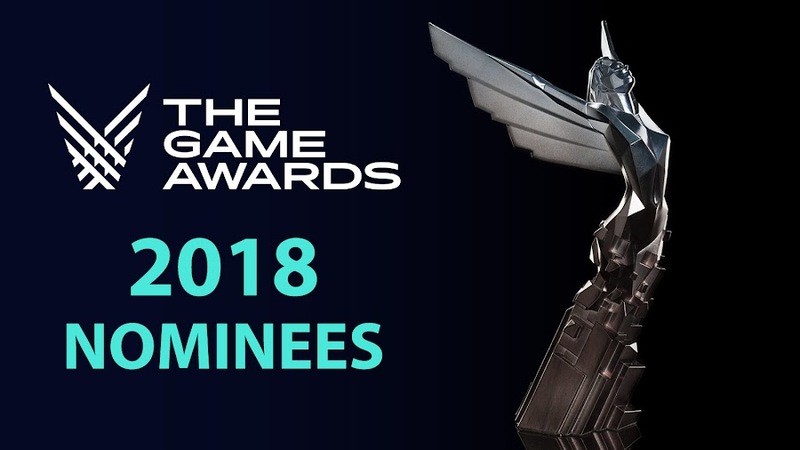 Epic Games can easily become a digital distribution platform giant in no time if they stay true to their plan of incentives and promises to share more details about their plans regarding the store this Thursday, on December 6 at The Game Awards 2018. 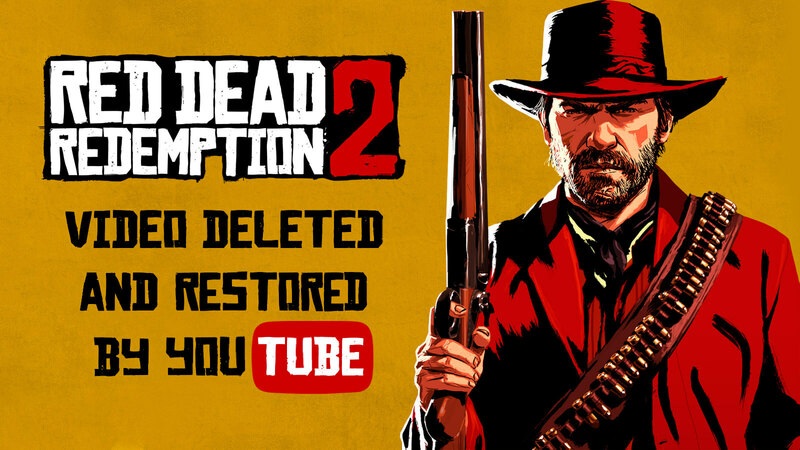 YouTube deletes and then restores back Red Dead Redemption 2 controversial videos of killing feminist NPC. Developer/publisher Rockstar Games didn't launch Western-themed action-adventure game Red Dead Redemption 2 with intent of just riding horses and camping in the woods but it also involves a lot of rooting tooting cowboy shooting. Since the in-game lead character Arthur Morgan is an outlaw, you expect him being involved in some activities during the gameplay that may not be pleasant but that is okay. However, it seems that YouTube wasn't so sure about it before it became a matter of concern. Recently, YouTube took down a gaming channel known as Shirrako Gaming of 500,000 subscribers base for a gameplay video they uploaded earlier, claiming the content have broke their community guidelines by showing the player attacking a feminist NPC (Non-Player Character). Titled "Annoying Feminist Fed To Alligator", the video depicts Arthur attacks a female suffragette before saddling her up on his horse and then feeding her to an alligator to take a chomp at her. He then stomped her with boots for a while afterwards. Now such display of violence against suffragette woman NPC in RDR2 are often labeled online as attacks against feminists and these videos are quickly becoming very popular to a certain part of gaming community these days. YouTube apparently couldn't tell real footage of violence from the ones taken from popular video game and took them down for breach of guidelines but these contents are only prohibited if they come under fire, which t didn't. 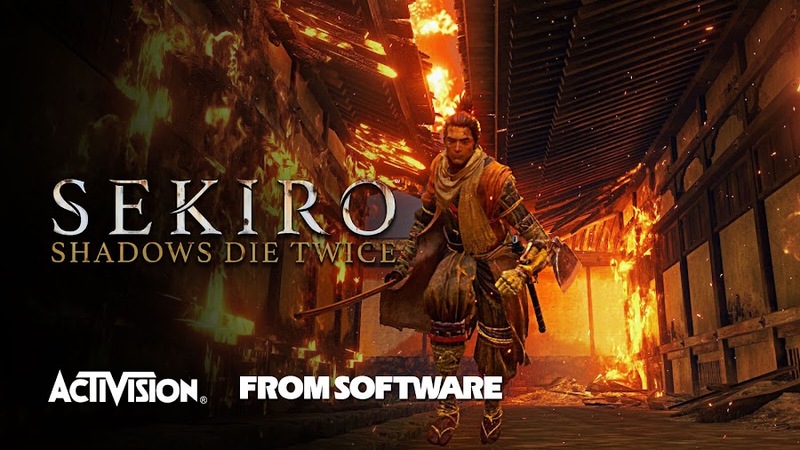 Shirrako Gaming promptly took Twitter to address the takedown of his channel by the video-sharing website for promoting violence by killing a female NPC. 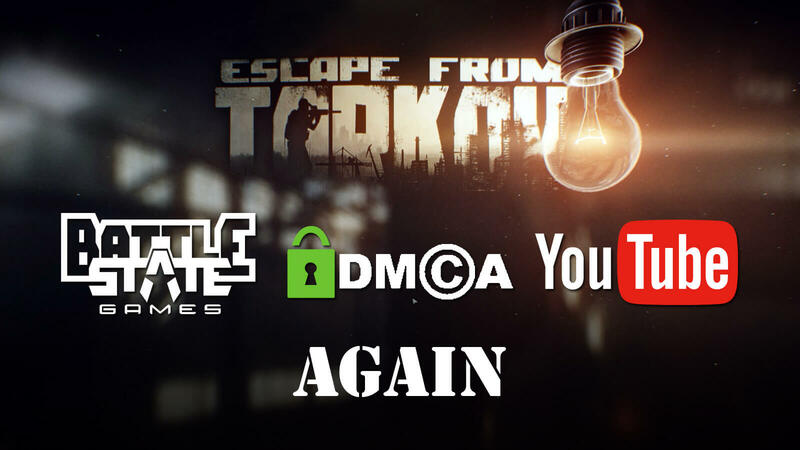 Immediately after the ban, a massive fan-outcry followed over the deletion move by the site and upon realizing their mistake, the action is reviewed again and the channel was eventually restored the following day with all videos. 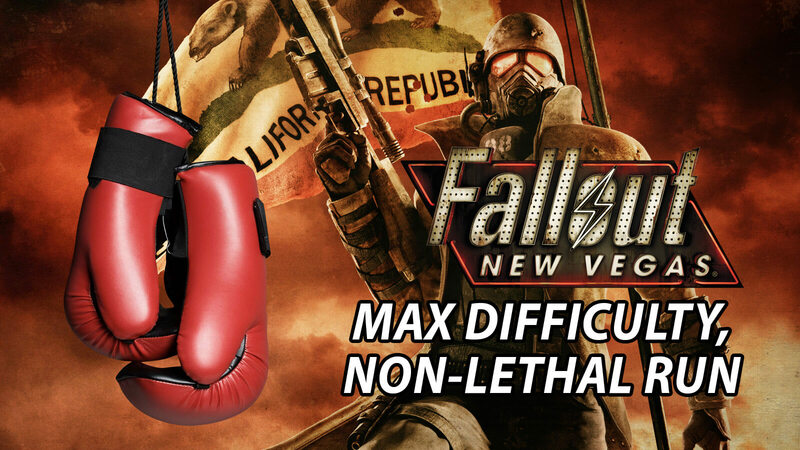 Seeing the matter going out of hands, the company's wider gaming team handled the situation and YouTube's head of gaming, Ryan Wyatt confirmed that they will educate the reviewers from repeating such mistakes in future to avoid such inconvenience. Here is the video in question that created the so called feminist controversy on YouTube regarding the game. Now that the air is clear once again, people are hitting search for Red Dead Redemption 2 videos where women's rights activists are getting punched in the face, run over by trains or even thrown into mine shafts in the Wild West. However, these controversial video clips are now restricted only to audience above 18 years of age and that clearly makes sense. Hopefully, the misogynistic attitude towards outspoken feminists within a game is not going to be the subject of their concern anymore. A new gaming hub is launched by YouTube that works to promote creators and serve better gaming content. One of the most popular categories of videos that effortlessly dominate YouTube than any other is gaming. Now, while players of different demographics can find it pretty exciting, it can be real tough sometime to find out definite titles or proffered creators on the platform. To tackle this unwanted issue, a brand-new dedicated tab is added to the video-sharing website for gaming related videos. This will help people find out the games they are looking for or popular gaming content creators. YouTube Gaming may not sound like a new concept because they previously served an app to show gaming content. 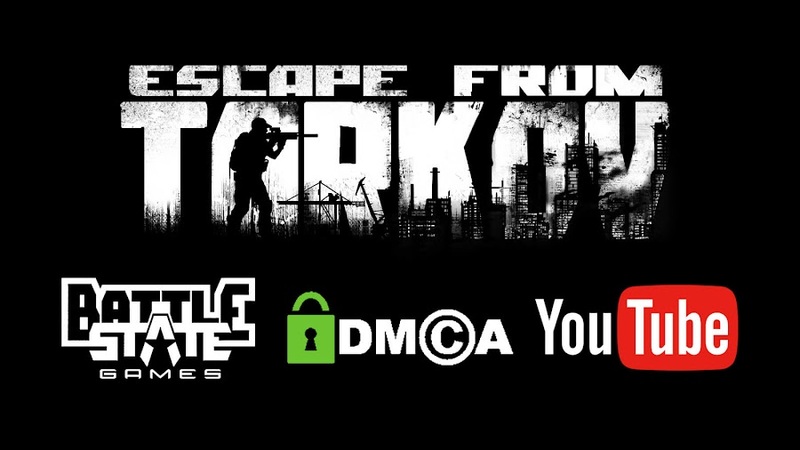 However, despite their best efforts to make it stand out, it actually hampered visibility for many creators, according to head of YouTube Gaming, Ryan Wyatt. Without the app or going to the gaming hub, people couldn't really find contents or their creators on the platform. Besides, most of the users simply used it for the regular streaming experience. Back then only a few handful of them came out on top while a huge number of them was never even reached. 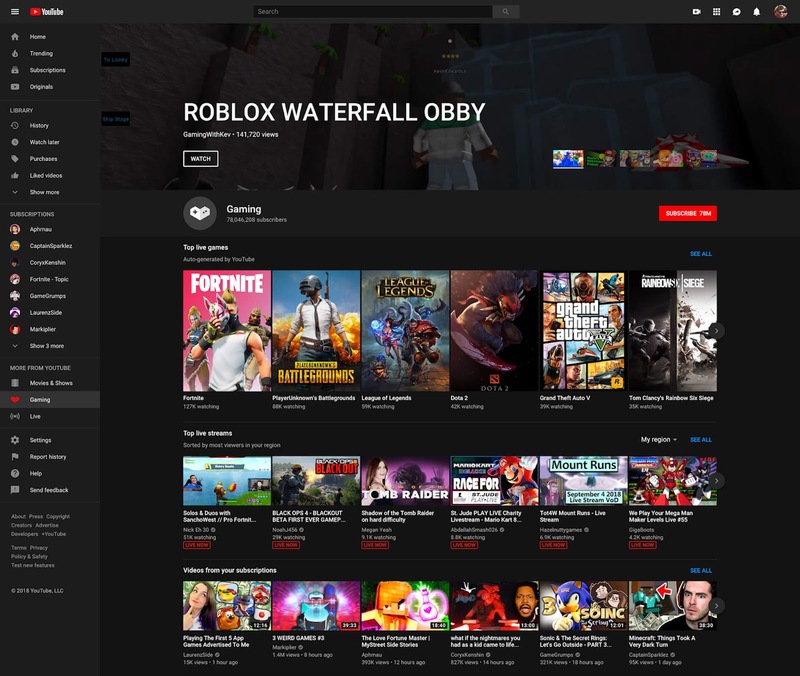 The new gaming tab on YouTube is added onto the main site and is designed to discover various creators, which will look the same as before. Meanwhile, the YouTube Gaming app will be available but only until March 2019, when it will be taken down officially. So, the community of gamers and creators will be all gathered onto one place for better access to find each other. As a pioneer in video-streaming sites, YouTube receives more than 200 million of traffic everyday who comes to watch gaming videos and live streams. It simply points out how bigger of a platform it has become for the video gaming community. Many come there looking for simple walkthrough videos, reviews, charity live and even Esports on a regular basis. Also, over the last 12 months, the site has amassed 50 billion hours of watch time from various range of gaming content. 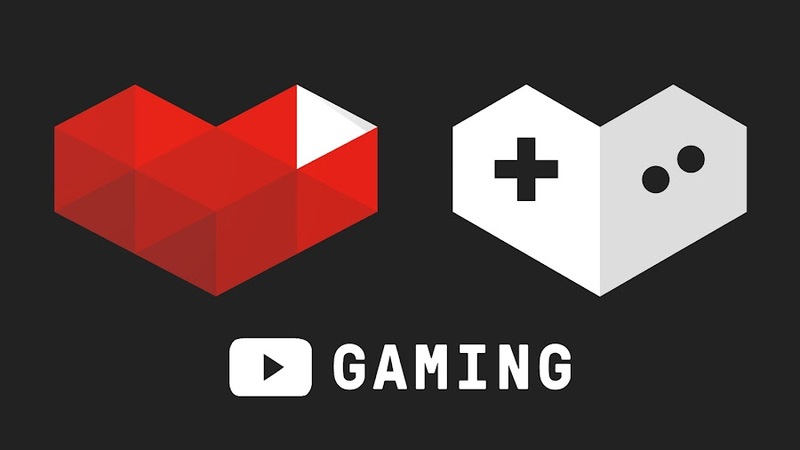 YouTube's new initiative for gaming has worked on essential tools for the past few years, focusing the efforts to deliver a better experience for everyone visiting the platform. In 2015, the newly launched gaming app failed but also helped the team test what works and what doesn't. Wyatt states that, with their redefined home for gaming, the tab will incorporate more with the main site and help every visitors find popular and preferred creators and their trending contents more easily. Users will receive personalized recommendations tailored for them at the top, based on their watch history as well as recently uploaded videos of your subscribed channels and their top live game streaming. Seeing all those changes introduced to the system, some might even say that YouTube is apparently trying to mimic Twitch on certain levels. However, Ryan Wyatt admits that despite gaming being one of the biggest parts of their business, Twitch is doing great in balancing live-stream. 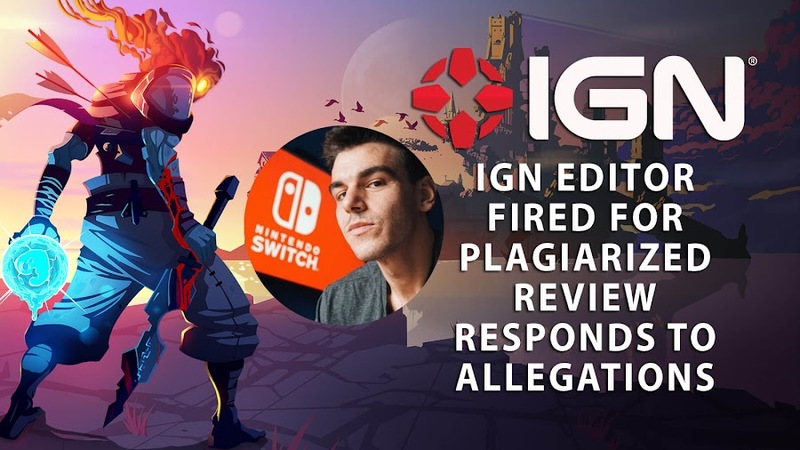 Fired IGN editor Filip Miucin talks about his involvement on the alleged plagiarism of Dead Cells game review. 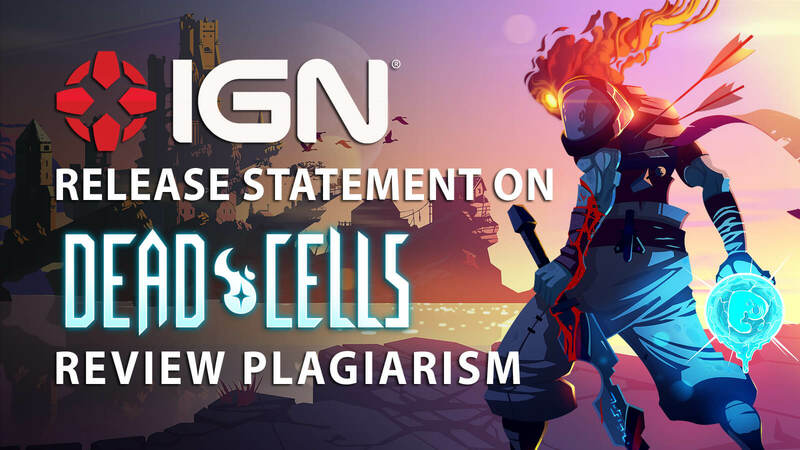 When allegations of plagiarized review on newly released rogue-like metroidvania game Dead Cells came out online on August 7, people started calling IGN out like crazy while they quickly deleted the copy from their site and took action against the accused editor Filip Miucin by officially firing him from their team. After taking heavy fire for past few days over this controversy, the accused have finally decided to take YouTube for explaining his side of the story in a response video. This is the first time when Miucin actually opened up about the fiasco that has disgraced him on public and cost him his job. However, his tone towards the matter was less than expected as he starts with saying that he didn't intentionally do that and then apologized to developer Motion Twin as well as his former employer company, except for YouTube channel Boomstick Gaming, who has accused him of content theft in the first place. It clearly shows that he was not sincere about his apology. Even IGN was open enough to publicly issuing an apology to a relatively small YouTube channel Boomstick Gaming who made a video by making side-by-side comparison about how his original review video on the game was copied. Miucin only made the video when people kept attacking him on social media but this response video was heavily downvoted by viewers and was later removed by him. So, what really stopped Filip from mentioning the source for once that he was ripping off? Previously, an article on Kotaku pointed out that he partially plagiarized the FIFA 18 review from NintendoLife site in last September. On account of that incident, original author of that review Chris Scullion stated over Miucin’s speech that, he clearly failed to admit his guilt. However, Boomstick Gaming has gained the spotlight and this newfound fame has tripled the number of Subscribers to the channel since then. After an allegation of plagiarism was raised on media giant IGN over the review of Dead Cells, the site reached out to release a statement. Fans of gaming and pop-culture heavily rely on entertainment websites and IGN being a media mogul in terms of that zone. 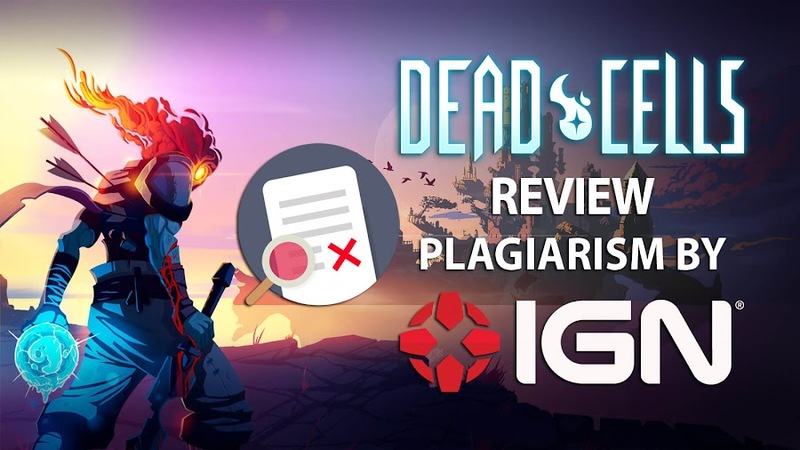 After a video gone viral about them publishing a plagiarized review of a recently released game, Dead Cells, people have gone crazy as one of site's editors Filip Miucin turned out to be the culprit behind the misdeed. They came with a decision of terminating the person in question after running some internal investigation following the disaster surfaced on the internet. YouTube channel Boomstick Gaming is literally a small channel compared to a giant enterprise that IGN is and they originally published a review of Dead Cells back in July. When the latter released a review on the game on August 6, he was surprised to find out that the site has completely plagiarized his own content. So, he published a video by making side-by-side comparison as proof of plagiarism by IGN. It soon became viral and people started questioning about their credibility. When the video with title "IGN Copied my Dead Cells Review: What do I do?" was posted on YouTube, Boomstick Gaming has never thought he will get any response from them but people on internet helped him by watching it over a million times and IGN also noticed this matter. Realizing the gravity of the situation, they fired Miucin afterwards and released an official statement on Twitter issuing a public apology for not being able to maintain a standard everyone expects from them. Developed by Motion Twin, Dead Cells is a rogue-like metroidvania title released on August 7 for Linux, Mac, Nintendo Switch, PC, PlayStation 4 and Xbox One. It entered Steam's Early Access in May 2017 and upon full-version release, the received positive reception and a review from the alleged site. They came under heavy fire when resemblance between these two contents left no room for considering the event as coincidence. YouTube channel Boomstick Gaming pointed out major similarities between their reviews on the game Dead Cells. After it saw release on August 7, 2018 for Linux, Mac, Nintendo Switch, PC, PlayStation 4 and Xbox One, rogue-like metroidvania game Dead Cells by developer Motion Twin has been receiving mostly positive reviews from various video game enthusiasts. Just as many other popular gaming sites, media giant IGN also published their perspective on the title in a broad review recently but has eventually removed it for alleged plagiarism by YouTube channel Boomstick Gaming. Back in July, relatively small YouTube channel Boomstick Gaming has first released a review of Dead Cells. Lately, they noticed some uncanny resemblance with the one published by IGN when they came across it. Although it could have been a coincidence, Boomstick ruled that out and made an allegation of plagiarism after comparing two reviews by doing a side-by-side analysis. The company decided to look further to investigate the claim and take out their article from site. To hear it from the horse's mouth, we have a clip from Boomstick channel that explains the incident of the content copied from their video. IGN has since gotten rid of the written version of the review article and video from their site, adding just an editor's note. They apparently begun to investigate about this matter and if the claim is true, then it is a horrible betrayal of trust from their side. Because, Boomstick is a channel with only 14,000 follower base and compared to the party in question that is a very tiny group of audience. What makes it worse is that, the review came from one of the site's editors Filip Miucin. With a minimalistic plot, the game advances as player character called the Prisoner goes through one castle to another on an unnamed island. 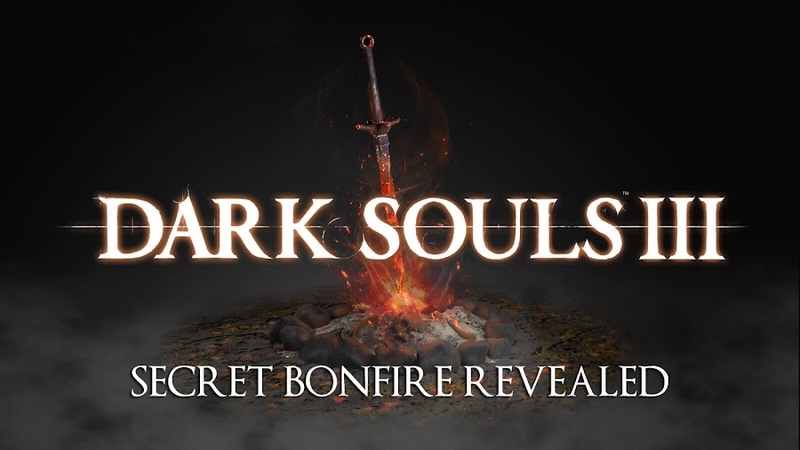 Since there are no checkpoints, you start over from the beginning of that level and it feature a combat system that is similar to Dark Souls games series even though the surroundings are in 2D. Despite the aspects that makes it a bit hard to win, Dead Cells will never really become disappointing just for the difficulties it presents to player. This is not the first time when integrity and quality of a review came into question as we saw Warner Bros. pretending in past that covering of Middle-Earth: Shadow of War by prominent YouTuber and social media influencer PewDiePie was one of his independent works and no money were exchanged for it. Video game industry is a multi-billion dollar business and trusted personalities involved in gaming cannot just excuse them out of a controversy using ignorance. Using the astounding in-game multiplayer map editor, a fan has recreated Jurassic Park in Far Cry 5 game. Developer Ubisoft has made a comeback at their action-adventure first-person shooter franchise with Far Cry 5 in 2018 and the game did quite well despite some little political issues. Players didn't just stopped finishing their main story campaign of freeing Hope County from preacher Joseph Seed and his militaristic doomsday cult Eden's Gate, they decided to get creative with the game's map builder for multiplayer and has end up recreating the iconic Jurassic Park. If you have enough time and patience, the in-game map builder can be such a tool and the park from 1993 classic sci-fi movie of Steven Spielberg came alive as result of hard work from a fan. We saw a quirk of Baker Family from Resident Evil 7 and the mysterious tropical island from TV series Lost from ABC already. Now that Universal Pictures' Jurassic World: Fallen Kingdom is stirring hype among cinema loving fans, suddenly people are going crazy about dinosaurs and thus the Jurassic Park mod was born. 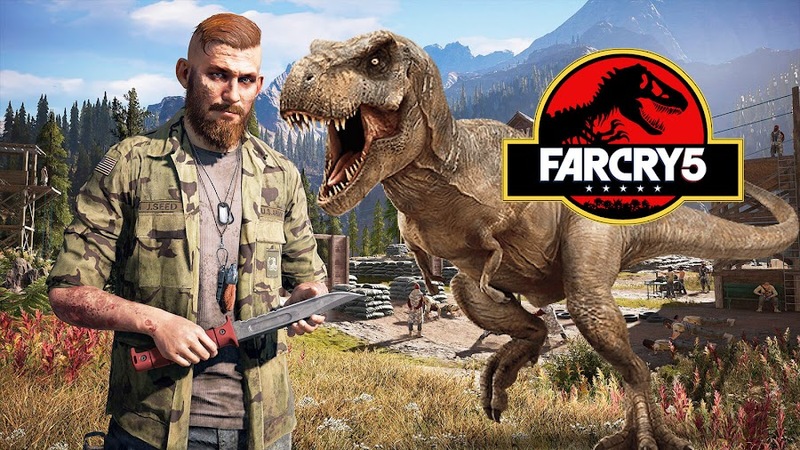 Community based gaming news sharing YouTube channel Forge Labs weighs in on Far Cry: Jurassic Park mod created by D4RKDEATH and you got a walkthrough in the clip below. There is a Pokémon GO-style augmented reality game Jurassic World Alive already out now and a park simulator called Jurassic World Evolution will release very soon but none of them comes any closer to the one we are talking about. While many players are eagerly looking forward for upcoming DLC packs to release, you can get busy with this brand-new Jurassic Park mod in the meantime and have some fun. Because, the fictional island of Isla Nublar is much scarier than Hope County, Montana. Akin to previous take on popular franchises with Far Cry 5 multiplayer map builder, this one tried to remain faithful to source material and many hidden Easter Eggs are planted within. Sadly, you will not be seeing any dinosaurs. Walking around the park, you will notice those electric fences to keep the Tyrannosaurus Rex inside from getting out to the toilet from where it later picked up lawyer Donald Gennaro, everything iconic is carefully placed there for sentimental fans. Aside from some rail shooters, a few park builders and a LEGO adaptation, Jurassic Park didn't get the attention or respect it deserved. Since two of the currently existing Jurassic World game is just a simulator and an AR, this new Far Cry 5 version is apparently the best experience you can get from the prehistoric adventure game series. Whereas we are shown what Ubisoft has ushered with their impressive map builder, we also are reminded that it's time they finally make a proper Jurassic Park game. 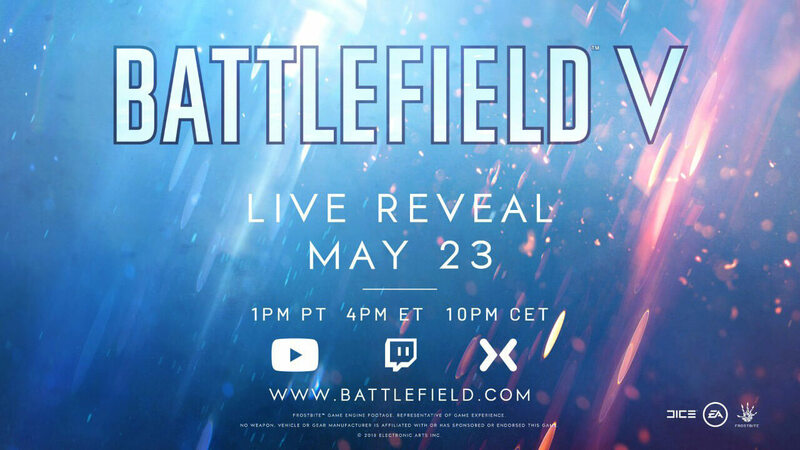 Putting all rumors and speculations to rest, official reveal for Battlefield V is heading this way and we have to wait only a few more days. When they mentioned for an untitled game from Battlefield franchise in last year's financial report, everyone has been waiting for it, while wondering what the title would be. Electronic Arts finally announced that in a live reveal event on May 23 at 1 PM PT, they will reveal the next game of their popular multiplayer shooter series. After initially let the cat out of the bag, EA has kept their mouth sealed up until now. Instead of confirming or denying anything, they just decided to sit back and watch the rumors fly. A theory of the game being set on World War II era and will be called Battlefield V came up. Then there was another that the new release will belong to their Bad Company series. Some even start calling it Battlefield 2018 before the official announcement came. Looking at their post on official Twitter account, we decided to run with the first theory. Also to let you know, this live reveal event will be hosted by Trevor Noah of The Daily Show, who posted about it on his personal Twitter account lately, which was also a rumor earlier. With that, he just cleared out all confusion and claimed it was "V EXCITING" for him. That is another clear hint at the game's current title. Given his day to day experience of hosting a popular show on a regular basis and having a fondness for video games, makes him a perfect choice for the job. Trevor Noah appearing on May 23 live event will surely increase the excitement for all the fans of this series from Electronic Arts. We also like to remind you that Call of Duty: Black Ops 4, the latest title from their rival series is going to be revealed tomorrow, which is earlier than Battlefield V. It will be interesting to see what predictions made by the players came out to be true and how much comparison people will do between these titles. You will be able to enjoy the reveal on Mixer, Twitch and YouTube when it is going to stream live. 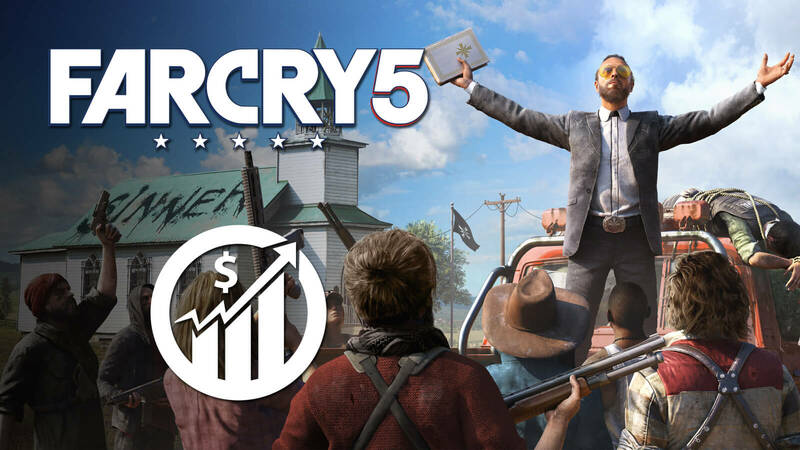 Developer Ubisoft is pretty happy these days as their recent release of Far Cry 5 from long-running first-person action game series has just become the best-selling title in entire franchise. 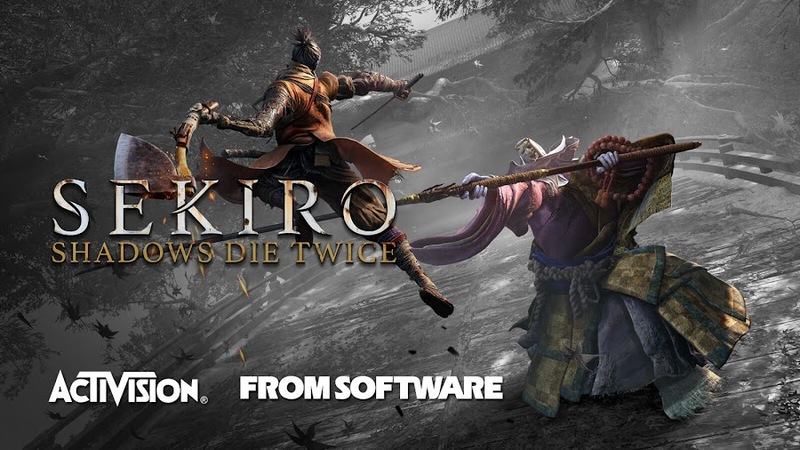 First week sell of this title surpassed double the amount than what Far Cry 4 made upon its initial release. More than half of these sales percentage came from digital purchase though. Before this title, only Tom Clancy's The Division saw such grand launch as another Ubisoft-made game. The studio has more to add along with those record-breaking sales numbers, because there are more to put in. Following the release of Far Cry 5, over 55,000 hours of gameplay was streamed on Twitch and videos on YouTube have crossed 117 million views. These two are both records for any Ubisoft game to have within a week of their launch. This clearly shows how positively players of Far Cry community have taken the game and their enthusiasm is coming out in numbers. 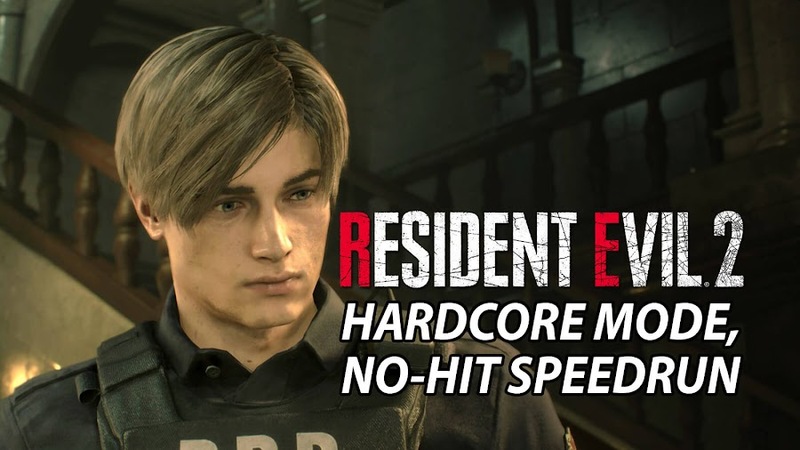 Aside from the sales bump, players are also leaving mostly positive feedback towards the game. It also becomes a best-selling title in UK as well. There is also some crazy statistics data gathered from the game like how many dynamite sticks have been thrown or how fake brands were created solely for the game and all you can possibly think of. Official Ubisoft Blog has recently released an infographic chart that has listed all of them and we are leaving it right below for you to check out. The adventure begins on tropical rain forest of Archipelago with ex-special forces operative Jack Carver and journalist Valerie Constantine in the first Far Cry game of the series in 2004. From there, the series has only grown by casting off and moving on with series protagonists one by one in each installment. Far Cry 5 is the first among the series to have an American setting and players are allowed to explore a vast location of fictional Hope County, Montana as they want. Seeing this immense success as years of work finally paying off, Executive Producer Dan Hay declared that they will be supporting the Far Cry fan base for upcoming months and years to come. Available on PC, PlayStation 4 and Xbox One, Ubisoft's first-person shooter Far Cry 5 is already out and making history.